« Preparing a classic: Pico de Gallo! Carne Asada (Grilled Steak) is most commonly a marinated and grilled flank or skirt steak which can be used in a wide variety of ways. Of course, you can eat it alone. However, slicing it for tacos and adding some grilled cambray onions (like green onions, but with a larger bulb), grilled nopales (from the prickly pear cactus), guacamole, pico de gallo, and freshly squeezed lime juice makes it absolutely mouth-watering. Remember, genuine Mexican tacos feature small, soft tortillas, stacking two at a time for each taco. 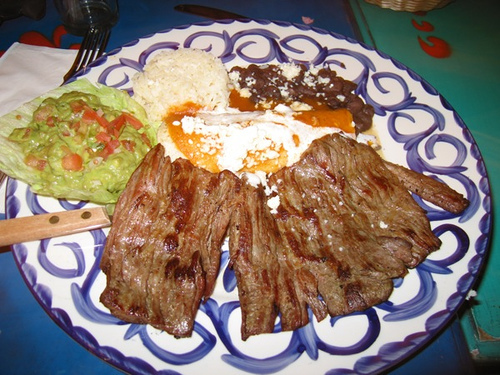 Carne Asada is also featured in tortas, delicious Mexican sandwiches using big telera bread rolls. For tender Carne Asada, marinating the flank or skirt steak anywhere from 1-8 hours does the trick. Traditionally, the marinade includes freshly squeezed lime juice, garlic, onion, cilantro and black pepper, but you can experiment with other fruit juices, such as orange and papaya. I like to add some hot peppers and a little beer to it as well. And remember, for best results grill the meat over a nice, hot fire. In many places, you can buy Carne Asada already marinated, which makes preparation easier, but that takes all the fun and experimentation out of it, doesn’t it? Not to fear, a lip-smacking recipe follows. Here in Mexico, if you’re invited to get together with friends and have Carne Asada, it’s basically equivalent to hanging out with family and friends for a barbecue in the U.S. So, try this recipe out at the next family barbecue and everyone will be dazzled!. Using a mortar and pestle, mash the garlic, hot pepper, cilantro, cumin, salt, and pepper into a paste. Gradually add the lime juice, orange juice, oil, vinegar and beer, stirring to mix well. Place the steak in a large pan or baking dish and add the chopped onion. Pour the marinade over it. cover with plastic wrap and refrigerate from 1-8 hours. Preheat an outdoor grill (for best results), or you can use an indoor grill or even the broiler option of your oven. Brush the grill with a little olive oil to prevent sticking. Take the steak out of the marinade and place it on the grill or under the broiler. When the juices begin to rise on the surface, season with salt and pepper. As soon as the salt liquefies on the surface, flip the meat to the other side and repeat. Grilling time is anywhere from a few minutes to 10 minutes each side, depending on the thickness of the meat and your preference for doneness. Remove the steak and let it rest for about 5 minutes to allow the juices to settle. Thinly cut the steak across the grain for tacos. Keep the Carne Asada warm in a covered dish. (If you’re grilling cambray onions and nopales, it’s best to do this before or concurrently with the meat, and set aside, keeping it warm.) You can also saute the onions used in the marinade in a skillet to add to the tacos. Warm the tortillas for about 30 seconds on each side in a skillet or on the grill. Stack the tortillas to keep them warm. To each tortilla, add some steak, the optional cambray onion and nopales, pico de gallo, and some juice squeezed from a lime wedge. This entry is filed under Beef, Dinner, Meat Recipes. You can follow any responses to this entry through the RSS 2.0 feed. You can skip to the end and leave a response. Pinging is currently not allowed.